September 12, 2018 (Joseph Thomas - NEO) - Media headlines claim an independent UN report is calling for genocide charges against Myanmar officials. Myanmar's senior military officials must be prosecuted for genocide and war crimes against the Rohingya and other ethnic minorities, a UN fact-finding mission has urged. The mission, which was established by the UN Human Rights Council in March 2017, found that Myanmar's armed forces had taken actions that "undoubtedly amount to the gravest crimes under international law". Al Jazeera admits Myanmar's military has been singled out by the report. Suspiciously absent from both the accusations made in the report and the charges called for, is State Counsellor of Myanmar Aung San Suu Kyi, referred to throughout the Western media and the report itself as the "de facto" leader of Myanmar. The leader of a nation is undoubtedly responsible for the actions of that nation's military and while some claim Suu Kyi has no power over Myanmar's military, Al Jazeera itself notes her silence in even condemning the ongoing violence. Local authorities, militias, militant “civilian” groups, politicians and monks participated or assisted in violations, to varying degrees. The report never qualifies or further discusses these "varying degrees." The report admittedly is dependent primarily on interviews. While videos and photography are also supposedly among the evidence the report is based on, neither are specifically referenced in the actual report. Many of the interviews were supposedly corroborated with likewise secondhand information obtained from what are referred to as "intergovernmental and nongovernmental organizations, researchers, and diplomats." These individuals and organisations are conveniently left unnamed and are most likely individuals and organisations directly funded by the US, British and European governments. In essence, it is US, British and European funded propaganda laundered through a UN report. Upon closer examination, Suu Kyi and more importantly her political supporters, have played a much more direct role in violence aimed at Myanmar's Rohingya population. It is an intentional and systematic cover up by Western media organisations and foreign-sponsored human rights advocacy groups ongoing for years, one the UN report is a continuation of. We can see the "legacy" of British and now US foreign policy in Southeast Asia still unfolding today, including in Myanmar's north where Kachin militants still battle against Myanmar's military and in the west, particularly in the state of Rakhine, where violence is ongoing between religious and nationalist fanatics and the Rohingya minority. This recent UN report attempts to place the blame for the ongoing violence against Myanmar's Rohingya minority squarely on the military. However, it was Suu Kyi's most vocal political supporters who had brutalised the Rohingya for years, long before she finally took power in 2016. Despite a concerted effort across American, European and Commonwealth media outlets to conceal Suu Kyi and her followers' role in the violence, occasional admissions have emerged. This includes articles like the UK Independent's 2012 report titled, "Burma's monks call for Muslim community to be shunned," revealing both Myanmar's "hardline Buddhists" and even activist groups celebrated in the West for "promoting democracy" being involved in persecuting the Rohingya. 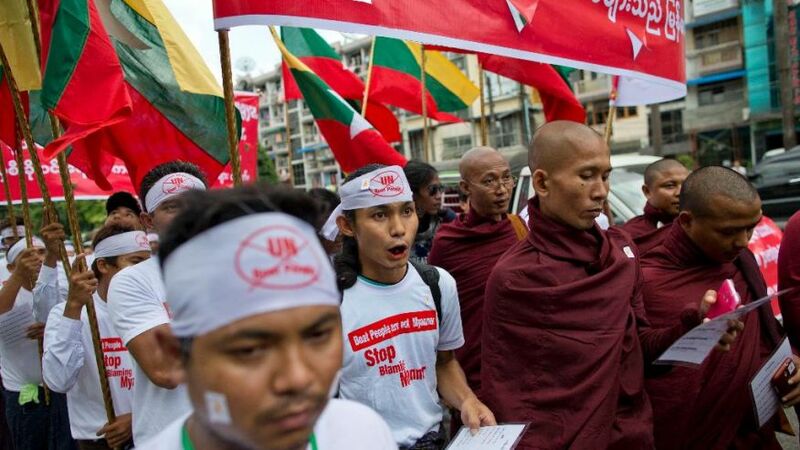 Monks who played a vital role in Burma's recent struggle for democracy have been accused of fuelling ethnic tensions in the country by calling on people to shun a Muslim community that has suffered decades of abuse. Ko Ko Gyi, a democracy activist with the 88 Generation Students group and a former political prisoner, said: "The Rohingya are not a Burmese ethnic group. The root cause of the violence… comes from across the border." Prominent members of the 88 Generation Students group received praise and recognition from the US State Department's National Endowment for Democracy that same year. In 2015, ahead of Myanmar's elections, NED's Dem Digest would praise Ko Ko Gyi and the 88 Generation Students group as, "smart, capable leaders, who were political prisoners." Since coming to power in 2016, only the most ambiguous criticism has been levelled against Suu Kyi, her followers including US, British and European-funded organisations all but unmentioned and the entirety of the blame for a conflict stemming from the intentional divide and rule strategy of European colonisation, laid solely upon Myanmar's military. The military remains a powerful, independent institution within Myanmar. It is still able to cultivate ties both with powerful groups in Myanmar and with Myanmar's neighbours. The chaos created by targeting the Rohingya has not been genuinely exposed and confronted by Western journalists and their counterparts among Western-sponsored human rights advocacy groups, but rather leveraged cynically to advance US and European foreign policy objectives. Washington's pivot toward Asia continues in earnest, albeit with a large deal of civilised pretences dropped. What had begun as a proposed diplomatic and economic reinvestment in the region has been revealed instead as a pan-regional campaign of political meddling, economic coercion and even military encroachment through a variety of means. Diminishing or entirely eliminating Myanmar's military as an independent institution and broker of political and economic power is part of a larger strategy to expel Chinese influence from Myanmar as well as the wider Southeast Asian region. Suu Kyi, while omitted from the brunt of US and European accusations regarding the Rohingya, is still mentioned, a reminder to Suu Kyi and her political party that if human rights could be leveraged to attack and undermine their political opponents, they could equally be leveraged to keep her and her National League for Democracy party aligned to Washington, London and Brussels by more rigorous means. As is the case across Southeast Asia, a fully functional client state is most likely beyond Washington and London's means. Instead, a strategy of producing partially functional or entirely dysfunctional client states surrounding China denies Beijing the ability to develop economic, political, diplomatic and military ties to their full potential, thus inhibiting the growth and development of China itself. Beijing is trying to end the long-running conflicts along its border with Myanmar — but only because it can’t exploit the region’s resources at will anymore. The article seems to relish the fact that Myanmar's dysfunction is costing Beijing a valuable regional partner. This is exactly the case in Rakhine state as well, where China has been developing a port and transportation infrastructure to link China's Yunnan province to the Bay of Bengal. Violence between Suu Kyi's political supporters and the Rohingya, including militant groups sponsored by US ally Saudi Arabia, jeopardises stability in Rakhine and all projects located there, including Chinese investments. Once again the UN is being used to leverage, not uphold human rights. The plight of the Rohingya is ill-served by reports omitting the role of Suu Kyi and her political supporters in fomenting violence against them. Entire groups who deny the Rohingya their citizenship and their humanity are omitted from the UN's report. If they are omitted from a report calling for justice, they are omitted from facing the justice called for. What is the UN report then, besides a cynical political charade and how does this charade reflect upon the so-called international order the US and Europe claim to uphold by backing the report? While it is very possible that factions within Myanmar's military are involved in the violence, it is clear that no credible, impartial investigation has been conducted into it, further undermining efforts to hold those responsible to account. The US and China are approaching the region from two entirely different angles. The US seeks to divide and rule in a modern day rendition of what the British did a generation ago. China seeks to build economic ties and physical infrastructure. It is clear which angle benefits the majority in Asia the most, but it has always been clear throughout history that it is easier to destroy than to build. In this respect, China and its partners have their work cut out for them and until the façade of human rights advocacy can be stripped away and the West's true intentions laid bare, it will continue to be an uphill struggle for real progress.